A delicious and refreshing salad with a wonderful dressing! A perfect recipe for the warm spring/summer days ahead. Enjoy on a bed of fresh baby spinach or your favorite greens. For dressing: Combine oil, vinegar, orange juice, Mrs. Dash, mustard, and honey. Place in a container, shake well, and set aside. Combine chicken broth, chicken, and celery in a medium bowl. Pour dressing over chicken mixture and toss to mix well. 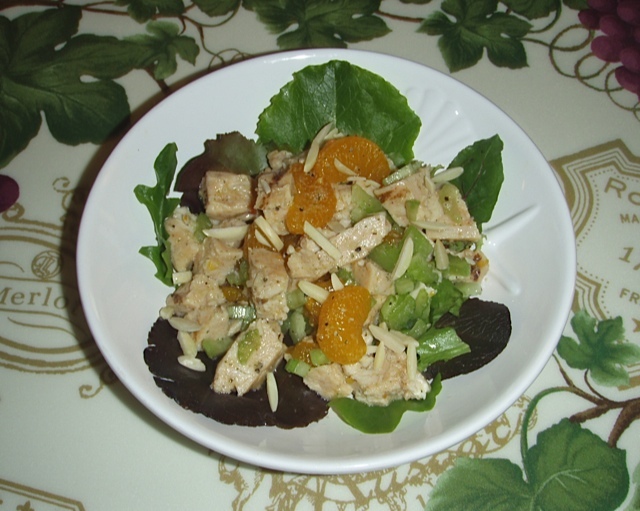 Combine orange segments and spoon mixture on a bed of greens. Add 1 Tbs almond slivers to each serving, if desired. If you would like a printer-friendly version of this recipe, Click Here. Note* - A wonderful option to the chicken stock/broth can be found at http://www.integrativeflavors.com/. These "Cook's Delight" food bases are all organic and a fantastic way to integrate flavor into your favorite recipes.